The Skeleton Coast in the extremely remote northwest of Namibia, formerly known as the Kaokoveld, is a study of life in extremes. The desolate coastline gives way to endless ancient valleys, rugged terrain and unbroken dune fields. The perennial Kunene River to the north is an oasis in this harsh landscape. Elephant, brown hyena and even lion have adapted superbly to the harsh dry environment. The Skeleton Coast experience may begin with a scenic flight over the coast, witnessing the drama of the landscape from a unique vantage point. Wildlife drives are conducted in the northern reaches of the 1.1 million-acre Palmwag Concession. Rise early in the cool morning and set out to find desert-adapted elephant or even lion shading themselves, and after a siesta and tea, explore new areas on an afternoon drive that lingers into the evening. Nature walks allow you to explore the open desert and identify small plants and creatures that manage to thrive in this seemingly bare environment. A full-day excursion to Klein Oase and Auses Spring reveals how water means life in this desert landscape. Watch for animals coming to drink and myriad birds fluttering around these lush oases. Interact with researchers studying the desert-adapted lion. 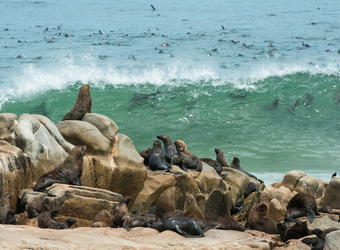 And of course, venture to the coast to see seal colonies and try to find a brown hyena. The Skeleton Coast occupies a unique position within the true Namib Desert with easy access to the Atlantic coastline, a stretch of sand known for old shipwrecks, whale bones and massive colonies of Cape fur seals. Many activities are conducted in the northern reaches of the Palmwag Concession, an area carpeted in sandy valleys and rugged mountains and surrounded by an environment that hosts a rich diversity of wildlife. Elephant have adapted to the stark desert landscape and thrive alongside giraffe and desert species like the gemsbok (oryx), springbok, steenbok, ground squirrel and scrub hare. Elusive lion can sometimes be observed escaping the heat of day in salvadora and salsola thickets. The coastal area is a stark contrast to the inland desert with seal colonies, black-backed jackals and brown hyena. Birding reveals endemic species such as Rüppell's korhaan, Benguela long-billed lark and lark-like bunting near camp, along with tractrac chat, jaegers and skuas found near the seal colonies. 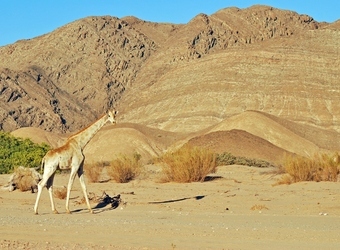 The Skeleton Coast is just one stop on a well-rounded Namibia safari. For the desert and landscape enthusiast, Sossusvlei is a must with her majestic orange sand dunes, and the Hartmann Valley is an even more remote location to explore the desert and meet local Himba tribal people. Wildlife enthusiasts should absolutely visit nearby Damaraland as well, and the premier wildlife viewing area of Namibia, Etosha National Park, where lion, leopard, cheetah, rhino, elephant, zebra, giraffe and many more large mammals thrive. 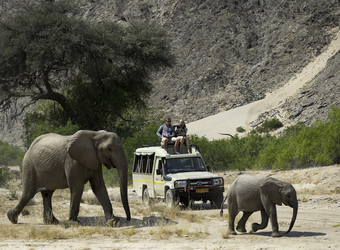 All five locations create the perfect Namibia trip for all ages and interests. When did you visit Skeleton Coast?